Most of the virtual machines I build are not connected to the internet due to some corporate restrictions my company has enforced. Therefore, I always need to do offline installations of all of my software. Now, I do build a lot of SharePoint farms and by a lot I mean, A LOT. I probably spin off a new farm every two days or so for various purposes, so for me having a repeatable installation process is key. The first thing I did when SharePoint 2016 IT Preview came out on August 24th 2015 was to download all of the prerequisites components and write a PowerShell script that would automatically go and install them offline. For SharePoint 2016, the prerequisites are almost essentially the same as they were for SharePoint 2013, with one or two differences (e.g. .Net Framework 4.5.2). 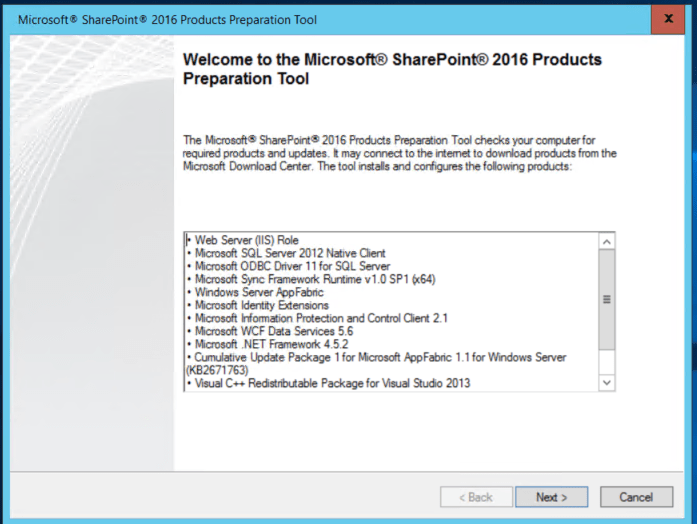 The following is a list of all of the SharePoint 2016 Prerequisites components you would need to download if you were to do an offline installation. Note, that if your virtual machine is connected to the internet, the prerequisite installer module of the SharePoint 2016 media will automatically take care of downloading and installing the bits for you, so you don’t need to manually download them all. Microsoft Sync Framework 1.0 SP1 (Synchronization.msi)Extract the appropriate file from the ZIP package. Start-Process "D:\PrerequisiteInstaller.exe" –ArgumentList "/SQLNCli:$SharePoint2016Path\sqlncli.msi /IDFX11:$SharePoint2016Path\MicrosoftIdentityExtensions-64.msi /Sync:$SharePoint2016Path\Synchronization.msi /AppFabric:$SharePoint2016Path\WindowsServerAppFabricSetup_x64.exe /MSIPCClient:$SharePoint2016Path\setup_msipc_x64.exe /WCFDataServices56:$SharePoint2016Path\WcfDataServices.exe /DotNetFx:$SharePoint2016Path\NDP453-KB2969351-x86-x64-AllOS-ENU.exe /MSVCRT11:$SharePoint2016Path\vcredist_x64.exe /MSVCRT14:$SharePoint2016Path\vc_redist.x64.exe /KB3092423:$SharePoint2016Path\AppFabric-KB3092423-x64-ENU.exe"
From there you can simply click Next on the wizard to initiate the installation sequence. Please note that you may be asked to reboot the server once or twice during the installation. After a reboot, the prerequisites installer should automatically continue its execution where it left. Thank you for the help. I have some questions. How can I add to this script the installation of msodbcsql.msi and Visual C++ 2015 Redistributable Package. Meaning, how can I know the parameters they use? Thank you in advance. KB3092423 shows at “AppFabric1.1-RTM-KB2671763” instad, please fix. Hi Nik, thank you very much for your work – VERY USEFUL. Also I found that under link to AppFabric1.1-RTM-KB2671763-x64-ENU.exe downloads AppFabric1.1-RTM-KB2671763-x86-ENU.exe. Good catch. The article and link has been updated. Thanks Dima! any idea how can this work on windows server 2016? just to highlight to everyone, in 3rd download “Microsoft Sync Framework 1.0 SP1” don’t forget to Extract the appropriate file from the ZIP package. I’ve beat my head on this for three days now, trying a variety of steps other articles offered. Your article was the only thing that worked for me. Thank you! !